Baccarat is a very popular table game among gamblers. There are many misconceptions regarding this game, some of the players believe that baccarat is a very complex game and require high level of expertise skill and knowledge on the part of players. However, this is not true in fact; baccarat is a very simple game. Here you need to wager three types of bets; the “banker” hand winning, the “players” hand winning and the two hands having tie. All these types of bets have some lowest house edge you will find in any casino game. 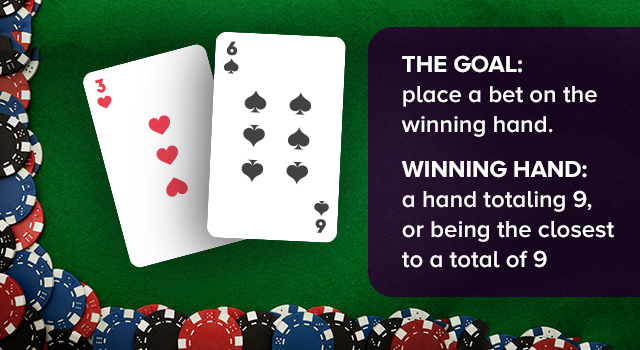 Hands wins when they are closer to a total of 9, with 10s and face cards counting as zero and aces counting as one. In case the sum of the cards’ value is higher than nine, the tens digit of the value is dropped so that a hand can never “bust.” For instance, a hand containing a 5 and an 8 would count as 3. Unlike blackjack, in baccarat after the cards are dealt, you cannot move with your strategy for turning the game in your favor. When this situation arises, a third card is drawn and only the dealer does all these as per the rules, which are set earlier. If initial cards of players are 9 or 8 then this is known as “natural” and this ends the play. On the contrary, if the player is fortunate enough to have initial cards as 2 and 6 then the total becomes 8, then no additional card is dealt and the player wins the game but only if banker hand is not natural. In baccarat, player does not play against the dealer but instead against another player, which ultimately changes the dynamic significantly. Only 2 hands are dealt and players are given the right to choose the hand they prefer and wish to pick; Its as simple as tossing a coin and predicting the result will be either heads or tails. As player as well as banker bet has low house edges, so the banker bet is the best option to move on with, at the baccarat table. This is so because banker bet incorporate 5% commission, which implies that in case you win, you own 5% back to the house. For instance, if you are wagering $10 on banker hand, means must give $.50 to the dealer. Do not step back from placing this bet because this commission is the factor that leads to long-term expectation of the banker bet. The type of bet that you should always avoid is the tie bet, because here the house edge is extremely higher as compared to others. Now as far as brick and mortal casino is concerned you will find two types of baccarat game there, one is the classic baccarat and the second one is the mini baccarat. Among the two, classic baccarat has created aura and mystique, which surrounds the game and discourages the news players from playing this game. Bothe these versions of baccarat has similar rules, the only difference is that mini baccarat is played on a normal table and like blackjack and other table games mini baccarat also has the same table minimum and maximum. In mini version dealer handle the cards. Mini baccarat is the recently becoming one of the popular baccarat version among gamblers.